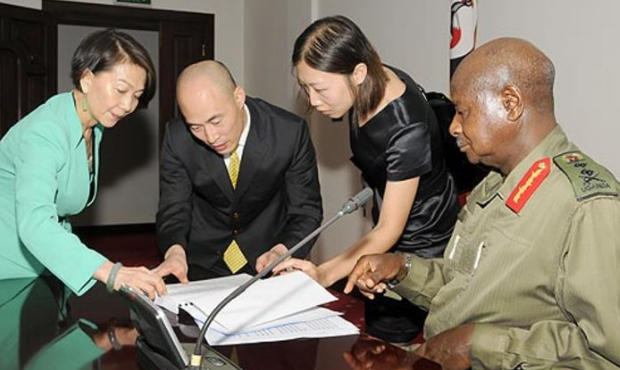 KAMPALA – President Museveni has ordered for the immediate suspension of senior officers in the Uganda Revenue Authority (URA) over frustrating an investor, a one Dongsong of M/S Guangzhou Dongsong Energy Group Company Ltd. 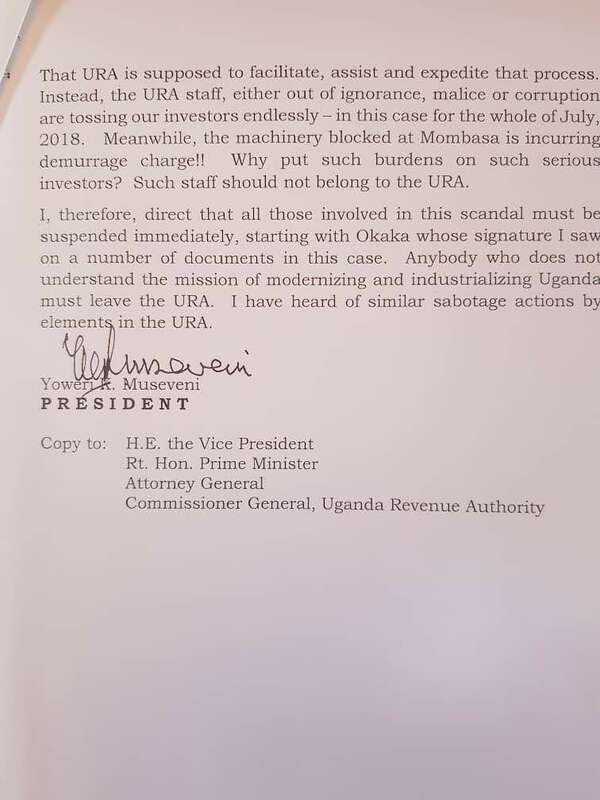 In a letter dated August 14, Mr Museveni directed the Finance Minister Matia Kasaija to fire anybody from the URA who does not understand the mission of modernizing and industrializing Uganda. “I, therefore, direct that all those involved in this scandal must be suspended immediately, starting with Okaka whose signature I saw on a number of documents in this case,” Museveni wrote. 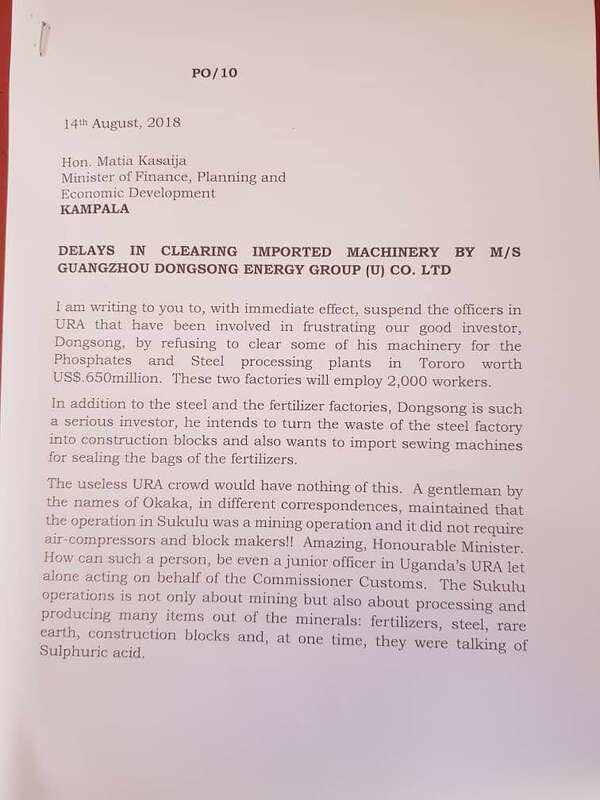 According to the letter, Mr Geoffrey Okaka the Manager Corporate Performance Reporting, Monitoring and Evaluation at URA refused to clear some machinery belonging to Mr Dongsong of M/S Guangzhou Dongsong Energy Group Company Limited, a Chinese investor who intends to turn the waste of the steel factory into construction blocks in Tororo. “The useless URA crowd would have nothing of this. A gentleman by names of Okaka, in different correspondences, maintained that the operation in Sukulu was a mining operation and did not require air compressors and block makers!! Amazing, Honorable minister. 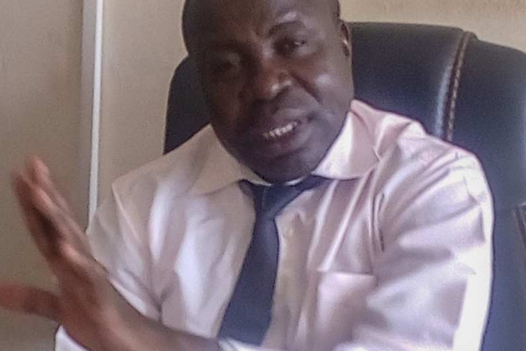 How can such a person, be even a junior office of Uganda’s URA let alone acting on behalf of the commissioner Customs,” Mr Museveni stated in the letter. The president said that URA is supposed to facilitate, assist and expedite the process but instead the URA staff, either out of ignorance, malice or corruption are tossing the country’s investors endlessly in this case for the whole July 2018. He stated that the Machine blocked at Mombasa is incurring demurrage charge why put such burdens on such serious investors? such staff should not bong to the URA. Museveni’s directive comes a day he had tipped foreign investors to report to him Ugandan officials who seek bribes for business tenders. “I hear that many foreigners think that Africa is so corrupt. Please, don’t give anyone commission because they don’t deserve it. In case anyone is trying to bribe you, whisper to the Ambassador, who will inform me and we shall deal with the culprits,” Museveni said. M/S Guangzhou Dongsong Energy Group Company Limited arrived on the stage in 2012, embarked on geological explorations of the hills to verify the reserves, and a year later, was awarded a 50-year licence for the Osukuru hills. The licence covers an area spanning 265 square kilometres. The company signed a mineral development agreement with government to establish the Osukuru comprehensive plant that will comprise a fertiliser manufacturing plant (from phosphate) and a steel plant from the vast iron reserves in Tororo worth US $650 Million. The agreement spells out obligations of the two parties, with government required to provide necessary assistance to Dongsong during the implementation of the project. It is for that matter but Mr Museveni said that instead, the URA is frustrating the process. “The Sukulu operations is not only about mining but also about processing and producing many items out of the minerals: fertilizers, steel, rare earth, construction blocks and at one time, they were talking of Sulphuric acid,” the president explained.